Curtains are a great way to obtain privacy in your home and block unwanted sunlight from shining in. Light filtering curtains provide you with similar privacy, but they allow limited amounts of sunlight to come through the window. Limiting the amount of light coming into your home with a light filtering curtain protects your furniture and keeps your home cooler. In addition, they reduce glare from the sun and make the room less bright. Light filtering curtains minimize the sun's glare. Chiffon is a very light-weight fabric ideal for the use of light filtering curtains. It is sheer with a flat-crepe textured silk and a soft, dull finish. Chiffon and be layered or used alone to create the desired thickness and block different levels of light. Used alone, it is very sheer and allows in large amounts of light. Layering the material creates a greater light filter and prevents glares. When made from cotton, silk, rayon or wool, twisted yarn provides a semi-transparent window curtain that filters light. It is called "voile" when it is made from wool and is both sheer and light-weight. This fabric is wrinkle-resistant and quick-drying, making the curtains low maintenance. The yarn is twisted very tightly and combined with other tightly twisted yarn to make the fabric. The qualities of this fabric are ideal when constructing a curtain to filter sunlight. Vinyl Mesh Curtains do more than simply filter light. This type of material helps protect you and your family from harmful UV rays. In addition, it helps prevent your furniture from fading from the sunlight. The sun creates spots on certain materials and fades the colors in others, such as leather. Vinyl mesh allots for both heat insulation in the winter and keeping the home cool in the summer. If privacy is a concern, but you do not want your curtains to completely block out the light, curtains with light filtering vanes is an option. 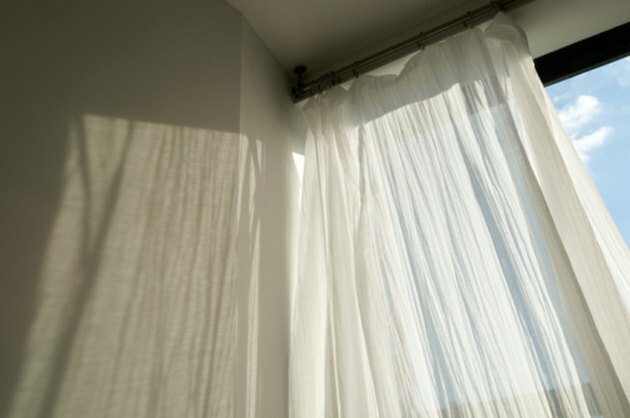 Unlike sheer light filtering curtains, curtains with vanes are made of cotton or other heavier fabrics. These curtains provide complete privacy when closed, just like standard curtains, but the vanes allow small amounts of light to seep through, warming or dimly lighting a room.